The first thing we did after our late get-up (7:45!) was climb back up to the top of Big Rock for some morning shots of Georgian Bay to the north and west and of Big Rock Bay immediately below us. It was a beginning of a sunny day with next to no wind and the paddling would prove to be easy. While we were up there we would see the only other paddlers of our four-day trip pass by below. They were headed west towards the Fox Archipelago. Before leaving our campsite, we did get a shot of it and the Big Rock top where we had spent some quality time. In the pic below the campsite is on the middle right and Big Rock is on the top left. Then it was time to move on. 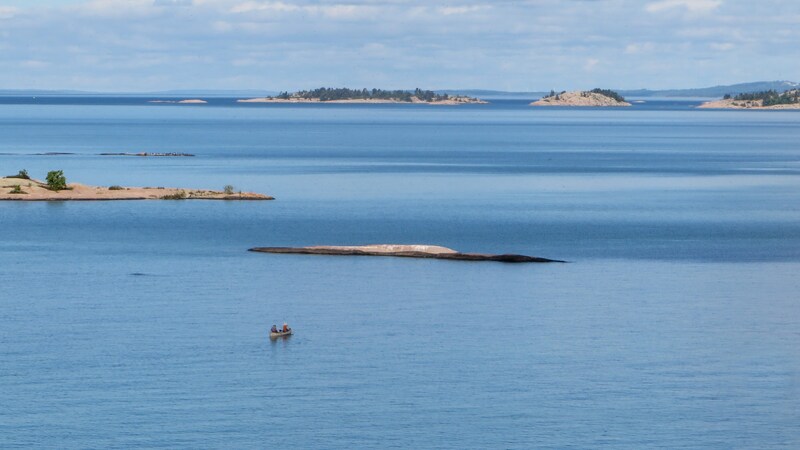 Given the tranquil water we found ourselves paddling across open stretches that we would normally have avoided in favour of a more protected route behind the scattered rocks and islands. We were treated to more Georgian Bay eye-candy as we paddled into one great photo-op after another. We went for a ramble on Hincks Island, checking out potential tent spots and putting our Helinox chairs together so we could sit while we enjoyed a Gatorade and Clifbar break. It was 11 a.m. and we had reached the east end of Philip Edward Island. We could have stopped at Hincks and chilled for the day – it certainly was scenic enough. However, we would prove once again that at heart we are canoe trippers as opposed to canoe campers. We decided it was way too early to stop and figured that lunch at the top of Beaverstone Bay and then maybe a campsite near there would make more sense. So off we went, making easy progress. 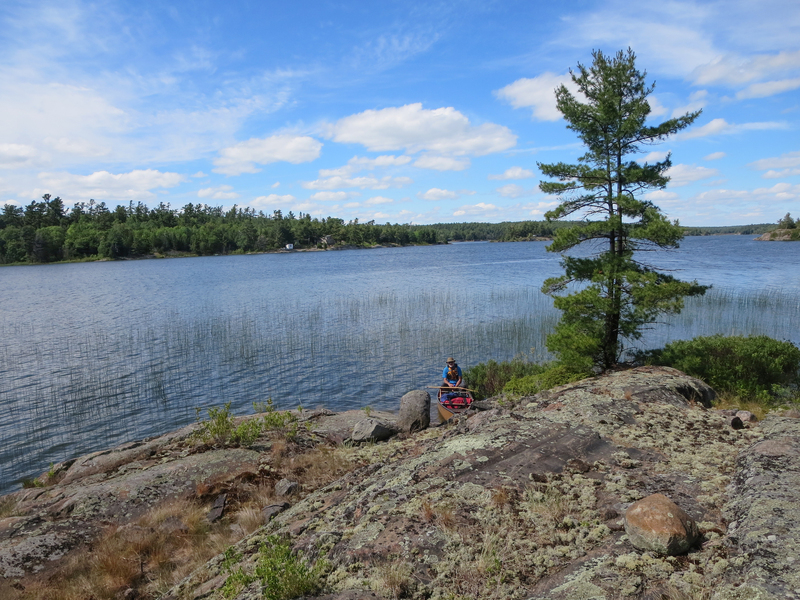 By 12:30 we had paddled the eight-kilometers to the top of Beaverstone Bay and stopped for lunch. We watched a Coast Guard boat chug by and enter Collins Inlet while we sat in the shade and sipped on our Thai noodle soups and munched on our Wasa bread with peanut butter. Then it was time to find a campsite. There was one indicated across from the used-to-be lumber mill community of Collins Inlet. We figured it would make for a good spot. 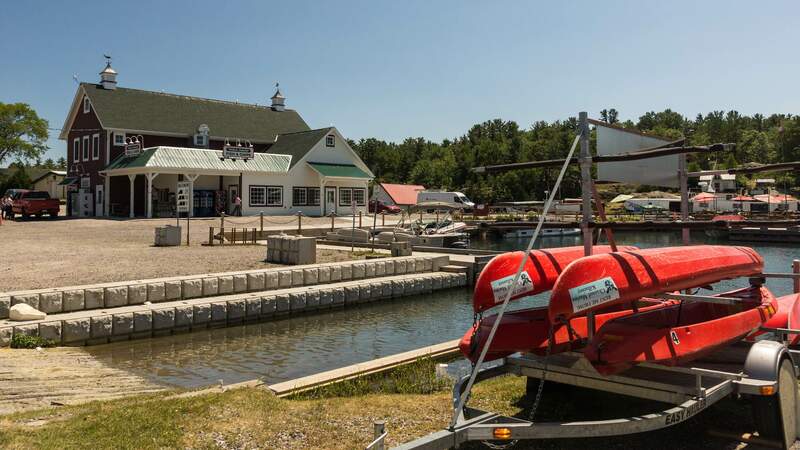 I was also expecting to see a marina there and meet boaters passing through the Inlet; I even suggested that we could have a second lunch at the restaurant! The state of the village dock in the image below was the first clue that my expectations were pure fantasy! The village of Collins Inlet died in 1917 when the lumber mill burned down; some of the pillars of the dock are amazingly still standing after 100 years of ice and thaw. 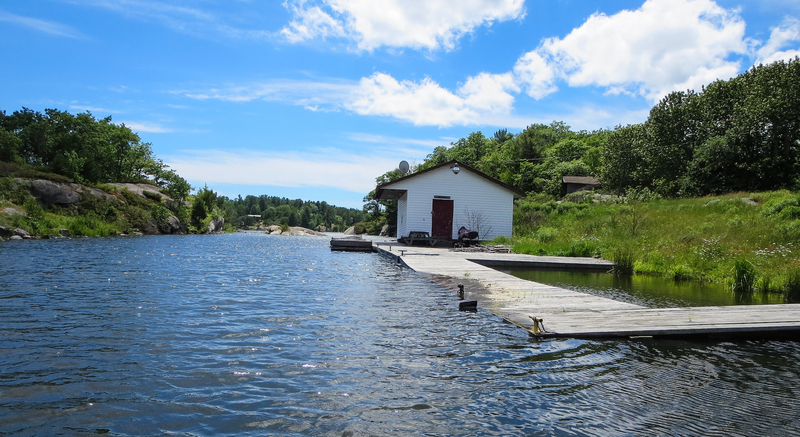 The Mill Lake Lodge sits directly across from the remains of the dock. 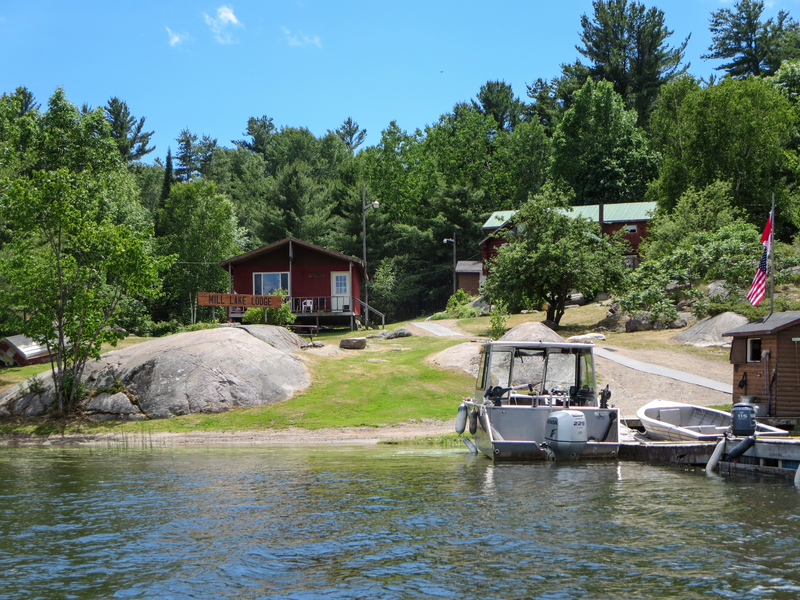 The Lodge consists of six cabins and the main building; it looks to be well-maintained and is definitely open for business. While we did not see anyone as we paddled by, that could be because the fishermen it caters to were all out for the day. Across from the Mill Lake Lodge are Mahzenazing Lodge and the remains of the once-thriving community of Collins Inlet. When the mill burnt down the site was essentially abandoned until someone turned what was left into a fishing and hunting lodge. 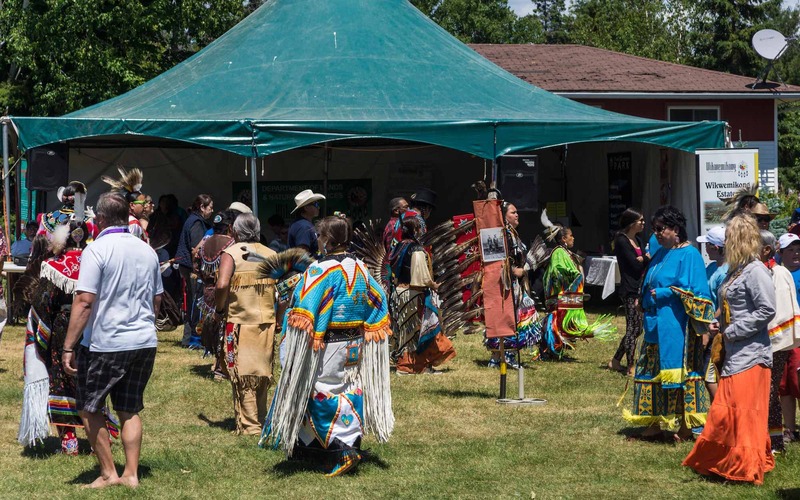 The 49-acre property is surrounded by the Grondine Indian Reserve on three sides and is billed as boat-access-only. As we paddled towards the mouth of the Mahzenazing River and the entrance to the Mahzenazing property we noticed the billboard below, complete with a realty sign affixed to it. A bit of research after I got home turned up some info on the property – it is listed for sale at $749,000. 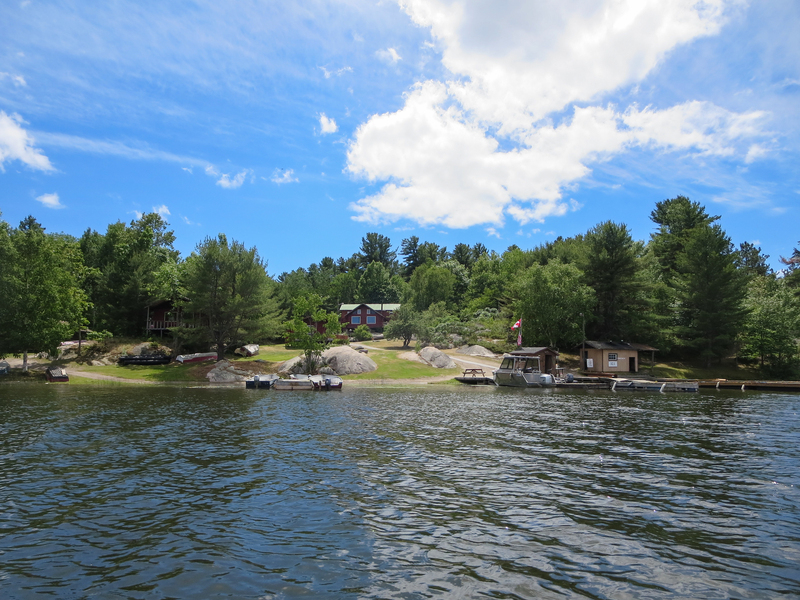 by Narozanski North Realty Inc. From the unkempt look of the site it is clear that it has not functioned as a lodge for a few years. Abandoned machinery sat there and at least a half-dozen “Private Property/No trespassing” signs told us we were not welcome but nobody seemed to be around to reinforce the message. And that marina and restaurant? Only in my imagination! end of our paddle up the Mahzenazing R.
Leaving the Mahzenazing Lodge property, we paddled back out to the Inlet. Not having seen the campsite supposedly just east of the Mill Lake Lodge, we paddled west and continued our search. 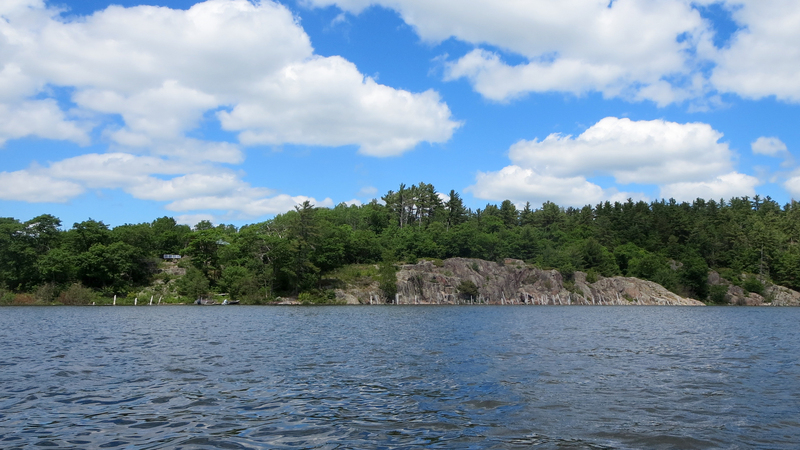 We had as our guide Jeff’s Killarney Map which indicated a few spots along the Inlet and down into Mill Lake. Our eventual conclusion after a few futile searches: what makes up a campsite may depend on whether you use a tent or a hammock and, if a tent, whether it is a one, two, or four-person one. Over the next hour, we paddled down Mill Lake as far as the south end of Green Island and checked out three different marked sites and a couple of unmarked ones that at first glance looked promising. Each time we refused to believe that was the best we could do. Finally, we admitted defeat and paddled back to the site directly across from the continuation of the Inlet on the west side of Mill Lake. We’d rate it a notch or two above “it’ll have to do”! A bit of work and our four-person MEC Wanderer was up for the night. There was also room there for another tent – a two-person. Not shown in the pic below is the flat rock on the shore that made for a nice exposed eating area. That night – with no wind and no sound of the waves – would be the quietest of the three we spent! The home stretch – the 16 kilometers of Collins Inlet back to the Chikanishing parking lot. This “inside passage” from Beaverstone Bay all the way across the north side of Philip Edward Island was a favourite of the voyageurs of old, as it gave them a brief respite from the potentially turbulent waters of Georgian Bay. We were actually a day early and in retrospect should perhaps have spent another day on the Georgian Bay side relaxing on Hincks Island. Just beyond Ambush Narrows, said to be the site of an Ojibwe ambush of invading Iroquois warriors during the Algonquian/Iroquoian War of the mid-1600’s, we paddled up to the Collins Inlet pictograph site. 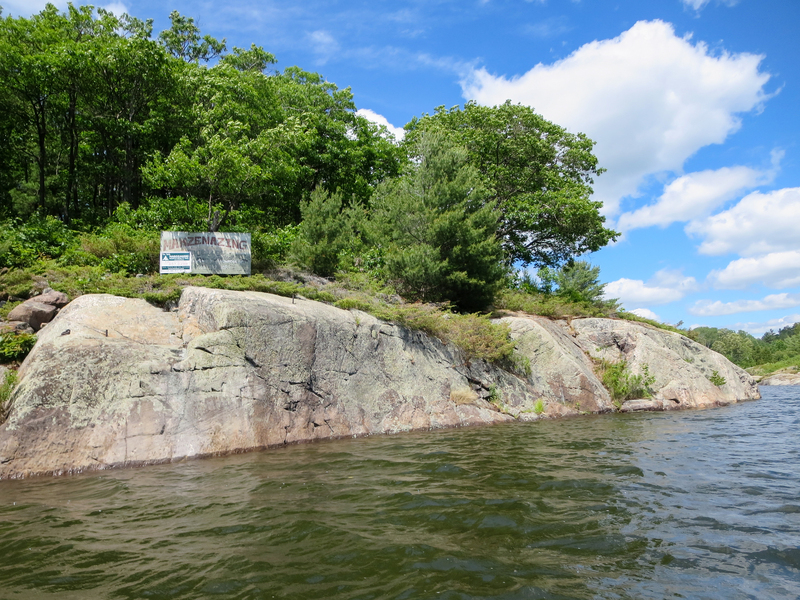 On a twelve-meter (about 40′) stretch of the rock face pictured below are faded red ochre rock paintings left by Ojibwe shamans or vision quest-ers sometime in the last three or four hundred years. They are not easy to see and, in fact, we did not see all of them on our visit. The reason – we only learned about their existence afterward. We would have looked a bit harder had we known! As for Dewdney, of the more than 260 sites he would eventually visit, the Collins Inlet site was #39. He was there early in the summer of 1959, having been at Mazinaw Lake (#37, #38) in the days just before. 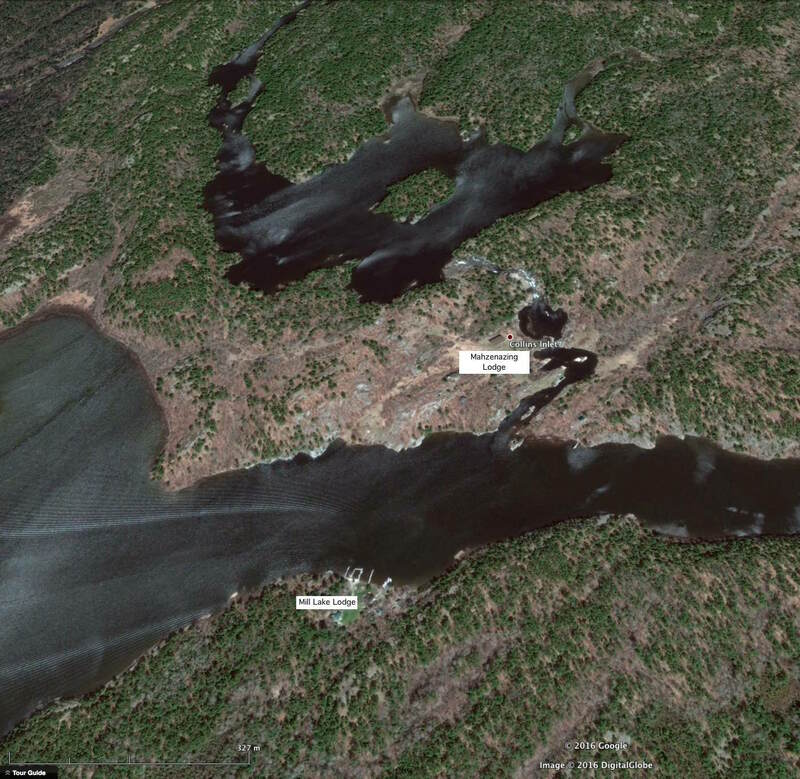 He would go from Collins Inlet up to Temagami to see the Diamond Lake site (#40) afterwards. On our visit to the site, the image below captures all of what we were able to see. We saw Panel II with its four levels of pictographs, one on top of the other. About three feet to the left of this vertical panel is what Conway labels as Panel III, a solitary Thunderbird image, barely discernible. Panel I is not in the image, but to the right and down closer to the waterline. 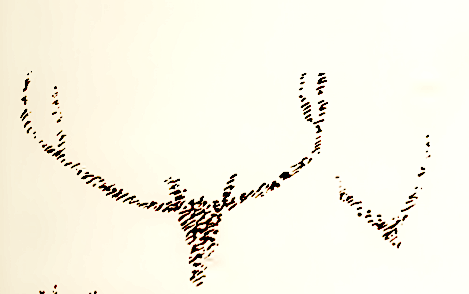 Conway’s sketch of the image is accompanied by a quote from Joe Wabegijig of Manitoulin Island, who first saw the pictographs in 1901 when he was twelve. We learn of the Panel I image that “…there was a head with horns also marked in red.” Conway notes that it is possibly a large head or mask but does concede that it may be something else entirely. This is the largest of the site’s panels. Dewdney comments only on the bottom image. I count twelve lines in his sketch. As he mentions, an alternative explanation is of a canoe with riders, indicated by the vertical lines. I’d go with the canoe. 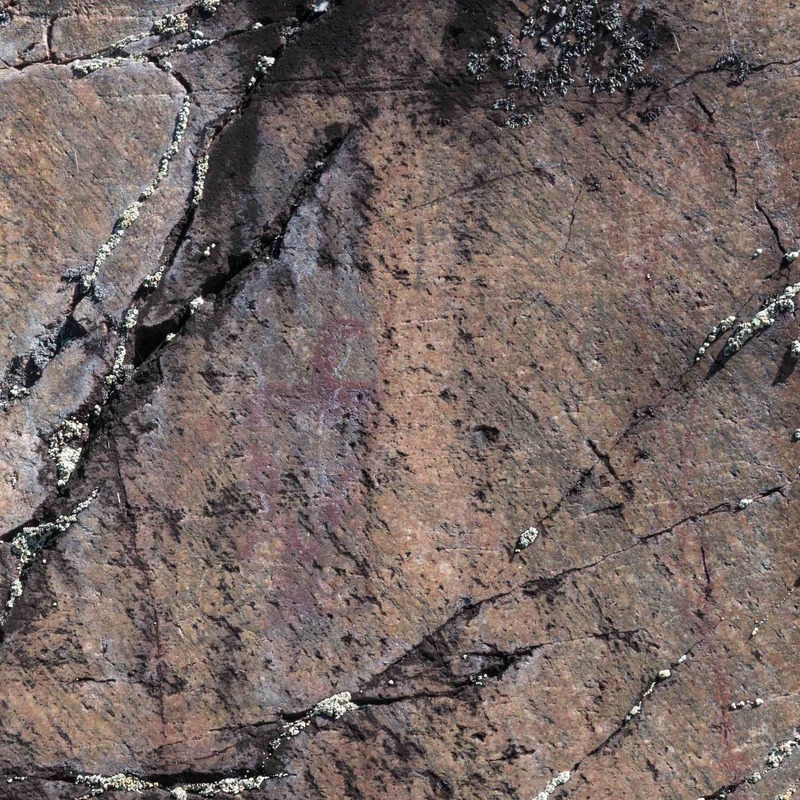 A calcite vein interrupts the canoe but you can see the continuation on the bottom right of the image below with four more riders indicated. Above the canoe is an image which most will assume is that of the Christian cross. If it is indeed a cross then the question arises – is it really the Christian cross? Some have argued that it is an ancient symbol used by the Midewiwin, the exclusive society of Ojibwe “medicine men” to indicate the fourth degree of attainment. 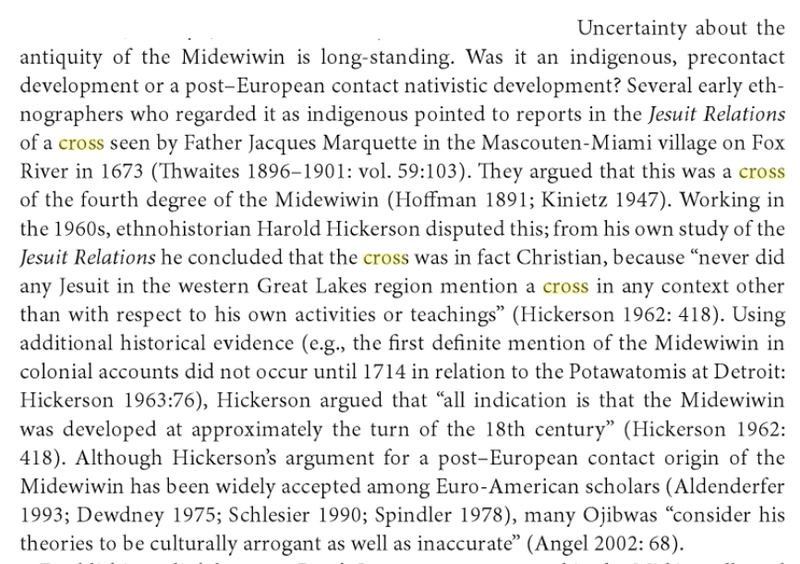 Others argue that the Midewiwin itself was a post-contact nativist response to the incoming Europeans and that it repurposed the Christian cross, an obvious power symbol to the Europeans, and gave it an Ojibwe-related meaning. See here for further discussion of this contentious issue! In looking at it I thought that it looked like a stylized and simple representation of a bird, an eagle (a totem symbol) perhaps or even Animikii, the Thunderbird. As opposed to a simple “plus sign”, the image bulges in the vertical middle and the top of the vertical line seems to have a beak point to the right. So…star – plus sign – Christian cross – bird? Who can say! Dewdney does not comment on this image or the ones above it in this panel. The zigzag lines at the very top of this small panel – well, again, who can say. In Dewdney’s sketch, they appear as indistinct smudges. Of the jumble of lines, Conway makes the following – a possible “shorebird track” and a canoe with paddler image. Bird footprints also appear at the Diamond Lake site. They may be statements of clan affiliation. 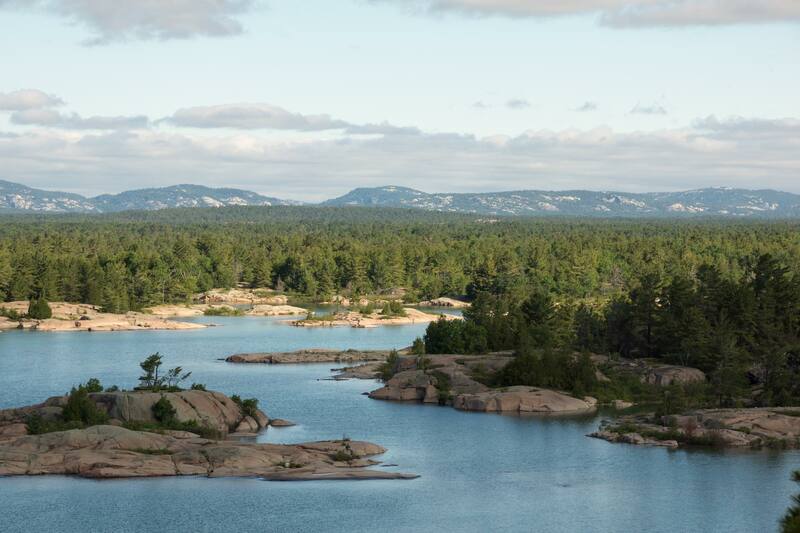 What also appears at the Temagami-area site is the horned snake image. Perhaps the zigzag lines depict a more horizontal version of the two-horned snake (Mishiginebig in Ojibwe) often depicted along with Mishipeshu. Its head and horns would be at the right side – i.e. 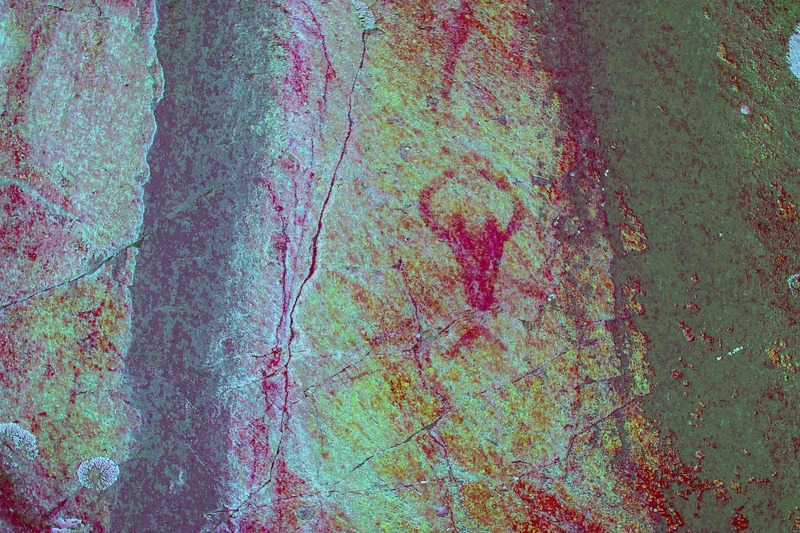 the part of the rock painting that Dewdney did capture. It is the horned snake image at Diamond Lake in Temagami that I thought of as I tried to make sense of the zigzag lines here. N.B. The analysis I provided above is likely off the mark! (Editor: Likely! Try 100%. 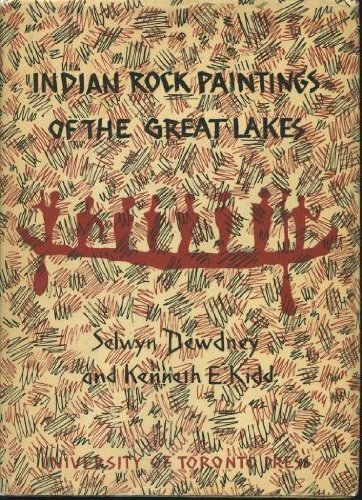 While Animikii, Mishipeshu, and Mishiginebig are indeed figures from Ojibwe myth and were common subjects to be painted, the human mind has a knack for finding and often imposing meaning and connection, even on events and markings that have nothing at all to do with the story that the viewer creates! To the left of the vertical panel is a lone painting seen in the image below described by Dewdney as “our ubiquitous—though somewhat battered thunderbird“. Looking at Dewdney’s sketch of the image, he was not able to capture much of it the day he was there. Perhaps the angle of the sun? Animikii’s body is a triangle shape; the beak on top faces to the right. And that is it for the Collins Inlet Pictograph Site. 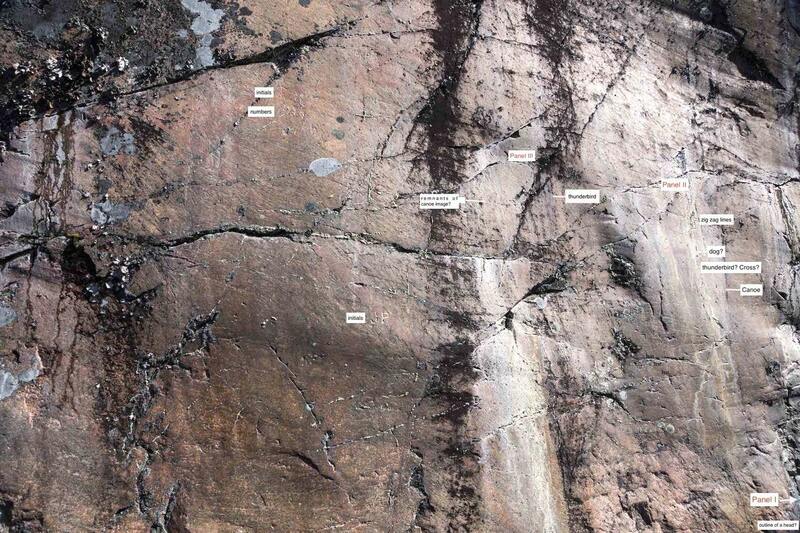 Here is an overview shot I took of the rock face with the various markings indicated. Missing from it are Panel I (somewhere to the bottom right) and Panel IV. (It is just to the left on the image I framed.) Already knowing that they are there will hopefully make it that much more likely that you will see them! After looking over the photos I took at the site and taking into account information gleaned and received since our visit, I can now identify the four panels that Conway uses to discuss the site. I’ve left in some of the tree growth in the rock face on either end to help as initial markers as you hone in on the various panels. 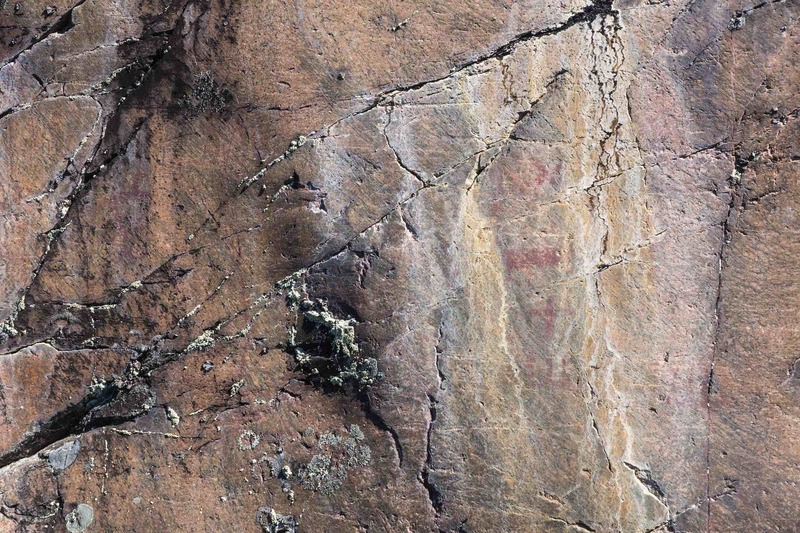 These pictographs face south and are quite exposed. Given all the human activity in the Inlet since they were painted here with the mixture of ground hematite and fish oil some three to four hundred years ago or so, it is nice to see that their presence has been respected by almost all non-Anishinaabe passersby going all the way back to Samuel de Champlain in 1615 (unless his trip down the Inlet pre-dated their painting). It may be that Dewdney was looking in the wrong place. Daniel Harmon’s journal entries for May 26 to May 29, 1800 indicate that he was on the north shore of Lake Huron on May 26 near the Serpent River mouth. 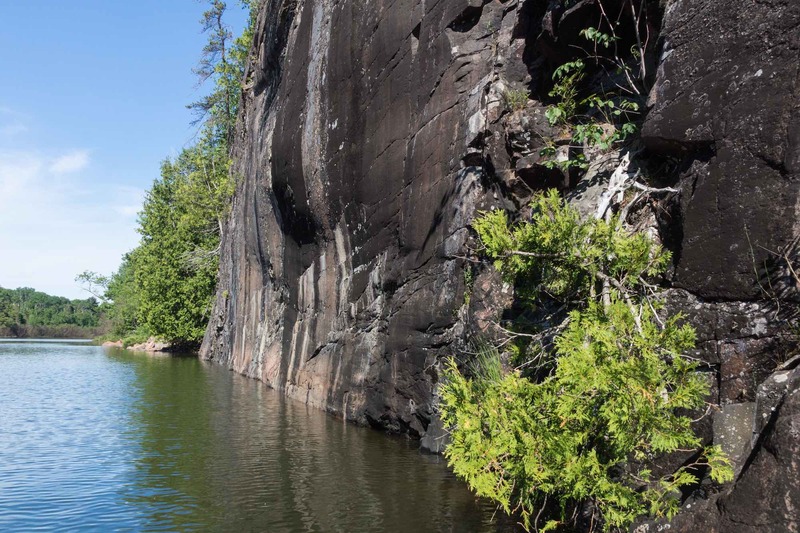 Scratched into the lichen on a rock face near the mouth of the Serpent River was that “astonishing serpent” that Dewdney was looking for. See here for a brief article by Thor Conway in the March/April 1985 newsletter (Arch Notes ) of the Ontario Archaeological Society. 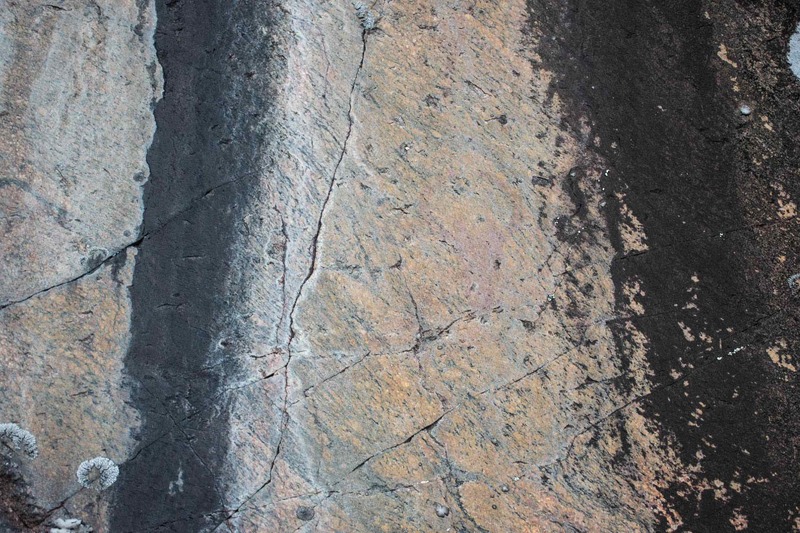 A pictograph site in the immediate vicinity of Point Grondine has yet to be found. If 22 kilometers qualifies as “not far hence” then perhaps Bigsby was relaying an account he had heard about the Collins Inlet site. It is clear from the text that their route did not take them through the inlet; he mentions the Fox Islands as their next landmark. Blue skies and almost-ripple free water provided ideal paddling conditions. We did note a good campsite or two on our left (the P.E.I. side) as we got closer to the mouth of the Chikanishing River. As we approached, a party of five or six canoes were heading out in the Bay; we caught the first two as they waited for the others. It was a Thursday; they would have more fabulous weather right through the weekend as they did their island hopping among the Foxes and the Hawks. We loaded our gear into the car and headed down the road for Killarney. While it was my first visit to the fish and chips place, my brother’s memory went back to the 1980’s when it was a humble little stand and not the elaborate building you see below. Speeches by Members of Parliament and elders were followed by a circle dance, some of which I captured on video below. Taking in the speeches and watching the dancing provided a great ending to our fantastic four-day paddle. The wind and waves we had spent the days leading up to the trip worrying about proved to be fairly benign and we got to experience a beautiful little slice of our province. Six hours after leaving Killarney we were on the shores of Lake Ontario – beautiful in itself and in its own way – but also a world away from the beauty of Killarney and the isolated north shore of Georgian Bay. 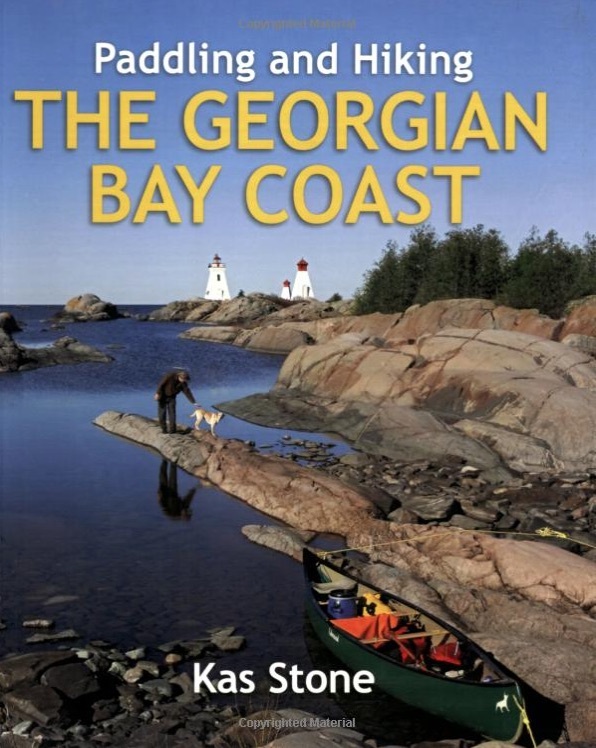 The most useful bit of writing on Philip Edward Island and the loop around the island is Chapter 4 in Kas Stone’s Paddling and Hiking The Georgian Bay Coast. An excellent overview map and a list of some twenty major sites to visit as well as a detailed natural and cultural history which puts everything into context makes it an essential read before you go. I have a copy on my bookshelf. We brought a photocopy along for the ride. Kevin Callan has a chapter on Philip Edward island loop in a couple of his books. I found it in his Top Fifty Canoe Routes of Ontario. 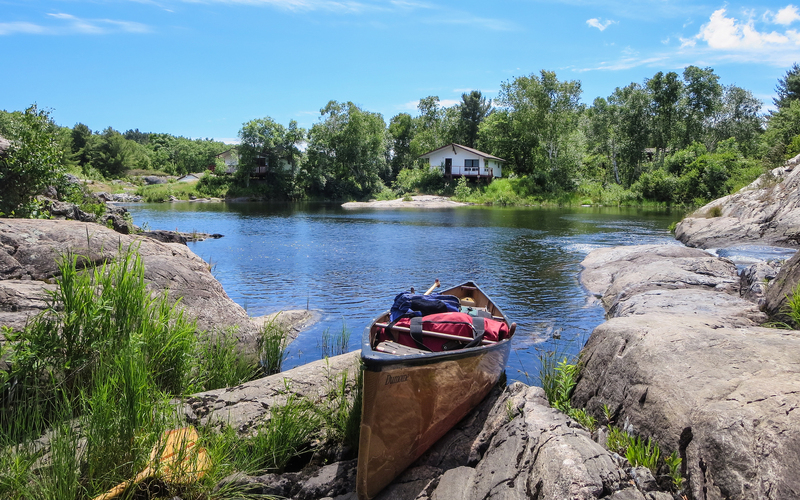 It is also in A Paddler’s Guide to Killarney and the French River. It has less detailed info than the Stone chapter but does provide the usual Callan drama and humour to entertain the reader. It’s worth checking out to see what he emphasizes in his account. If you want a bit more history then a recent Callan book – Dazed But Not Confused: Tales of a Wilderness Wanderer has a brief chapter on P.E.I. and Collins Inlet. You can read it (pages 99-102) online here at the Google Books website. 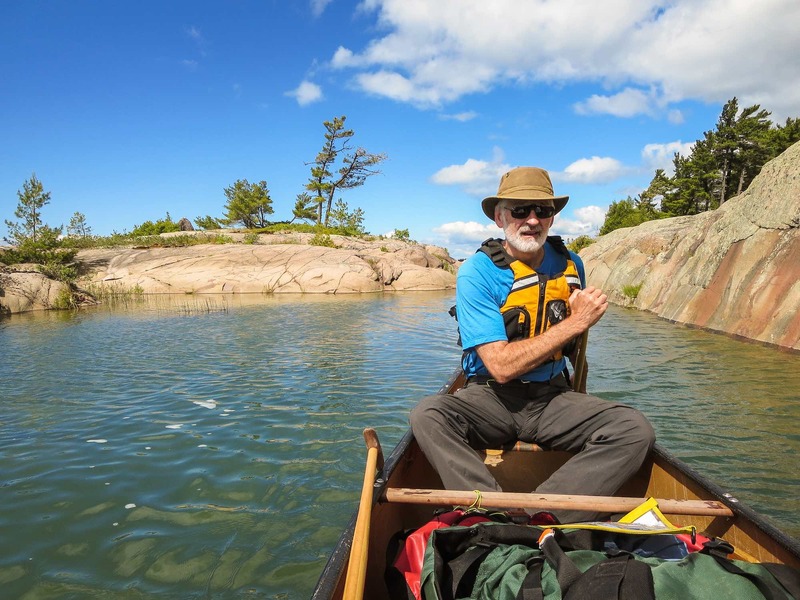 Killarney Outfitters has a useful webpage that will probably answer any question you might have about the logistics of a canoe or kayak trip in the waters of northern Georgian Bay. See here for their trip planning advice. Your best single map for this trip is Jeff’s Killarney & The Georgian Bay Coast map. A waterproof plastic version of the map can be found at a MEC outlet or at the George Lake Park Shop where you also pay for your parking permit. Or – you can download a copy and print out the bit that you need yourself. See here for the various file download options – jpg, kmz (Google Earth), Garmin GPS, and iPhone and Android options. Update: Since I wrote this post, a new map provider has entered the market. 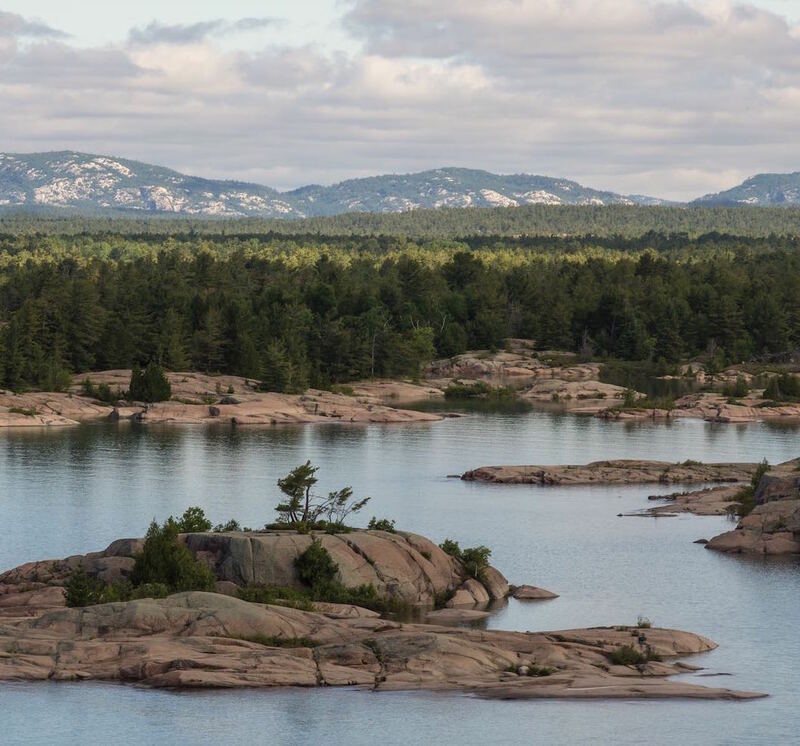 Called Unlostify and with the creator of Jeff’s Maps on its team, it has available for hard copy purchase or digital download, their own Killarney map. Click here to access the digital copy and print off what you need to do this trip – or invest in a very useful hard copy that you will be using again over the coming years. Another good map is the ChrisMar map Philip Edward Island & Area, also waterproof. However, it does not give any campsite info or pictograph locations. It was finding this map at the downtown T.O. MEC store that set the ball in motion for this trip. We also brought along our Garmin GPS devices. Given the maze of islands that you’re paddling through a GPS device with the Topo Canada maps (version 4.0) is definitely useful. If you don’t have a dedicated GPS device, your iPhone will do just fine. David Crawshay’s IOS app Topo Maps Canada is free and does a terrific job. See here for the iTunes page. Android users have the Gaia app. It costs $20. but gets excellent reviews from most who use it. See here for some info. There is also an IOS version of Gaia. there may be additional features that make it worth $20. more than Crawshay’s free app. If you are familiar with it, feel free to add a comment below explaining why it’s worth the money – or not! If you have the Google Earth app installed on your hard drive or if you use the Google Chrome browser, you can take a look at the 2.8 Mb kml file of our trip. Download the kml file from my Dropbox folder here. 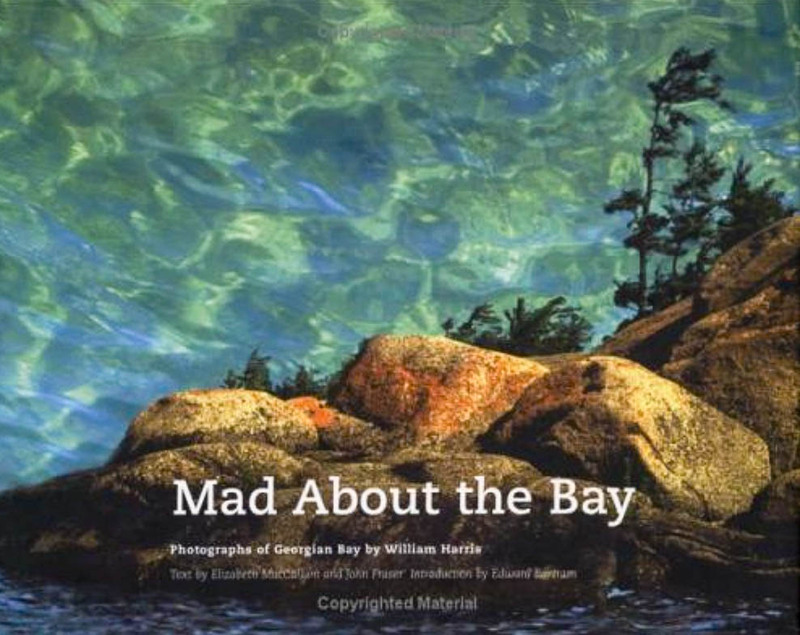 Mad About The Bay, a book of perhaps thirty photographs by William Harris and text by Elizabeth MacCallum and John Fraser, was published in 2004. I found it in the public library two years later and it prompted a one-week canoe trip in Massassagua Provincial Park that very summer. Using the latest technology, Harris provided a modern take on the Group of Seven’s vision from the 1920’s and 30’s. I wanted to capture some of the feel of Harris’ digitally enhanced Georgian Bay images. While I wasn’t successful, on the plus side I was now aware of the Georgian Bay coast as a fantastic paddling destination and as a great place to frame beguiling images in my viewfinder! Our Massassagua Park visit was done in August with way too many people around. We had to pre-book specific campsites for each night. We just don’t canoe trip like that! Also, we got to paddle in a thick ugly smog that had blown all the way up from the Ohio Valley via southern Ontario. No escape that summer! Our week in Massassagua would prove to be perhaps our most forgettable canoe trip! I will admit that the greater isolation of the Killarney area, the better weather we had this year, and the fact that we were there just before the summer holiday season and were able to choose our campsites each day made for a much better trip. Mad About The Bay shows up on the Amazon site – see here for its current status. If you are a Toronto Public Library cardholder, the system has ten copies available. You can reserve your copy here. 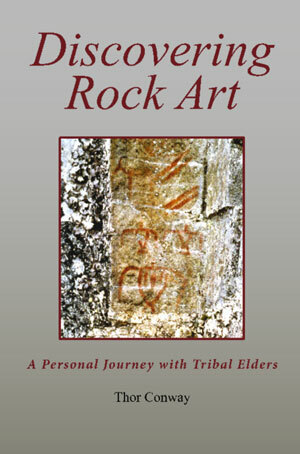 A copy of Conway’s Discovering Rock Art can be had from the author himself. See here for the web page. It can also be found at Amazon. 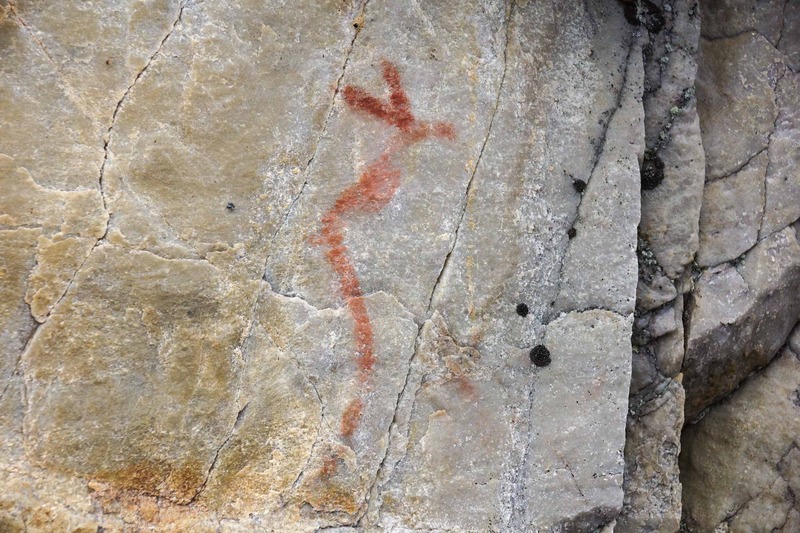 It provides essential cultural context for not just the Collins Inlet pictograph site but for a dozen in all, ranging from the Peterborough petroglyphs in eastern Ontario to the Artery Lake site on the Ontario-Manitoba border in Woodlands Caribou Provincial Park. Currently P.E.I. 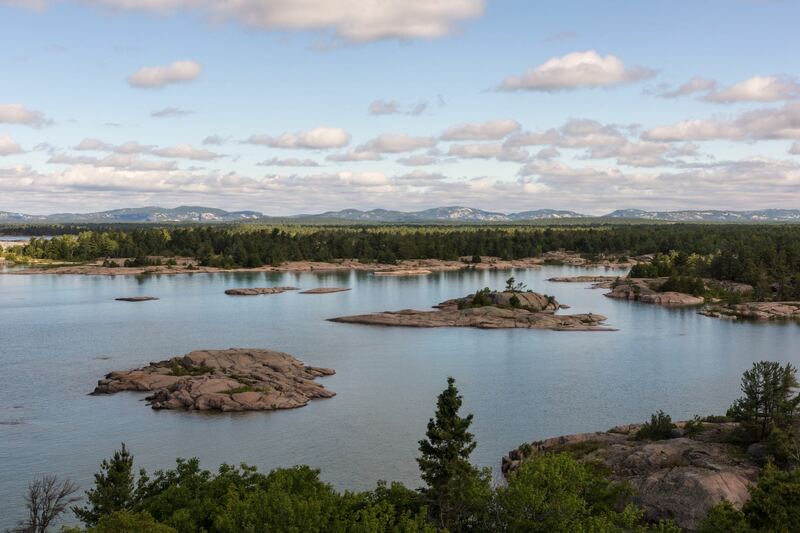 and the other small island archipelagos south of Collins Inlet and Beaverstone Bay are Crown Land and open to all. 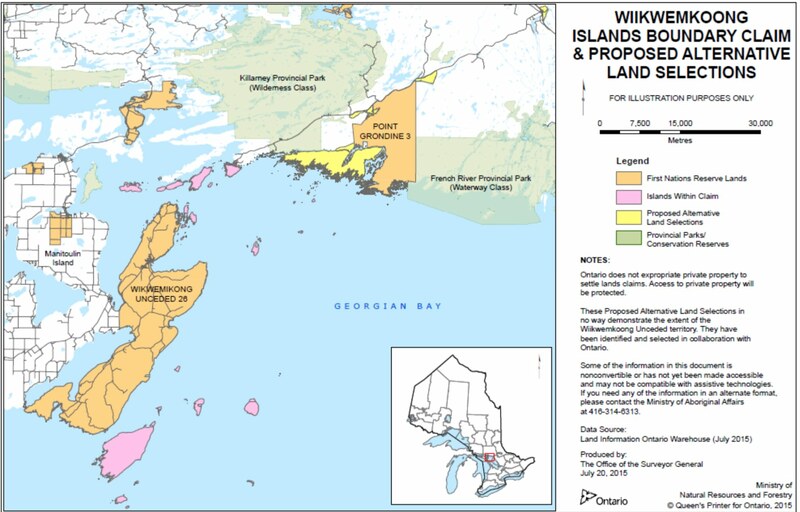 The map below shows the southern boundary of Killarney Park and of the Point Grondine Reserve (since 1968 a part of the Wikwemikong First Nation which is located on the east side of Manitoulin Island). 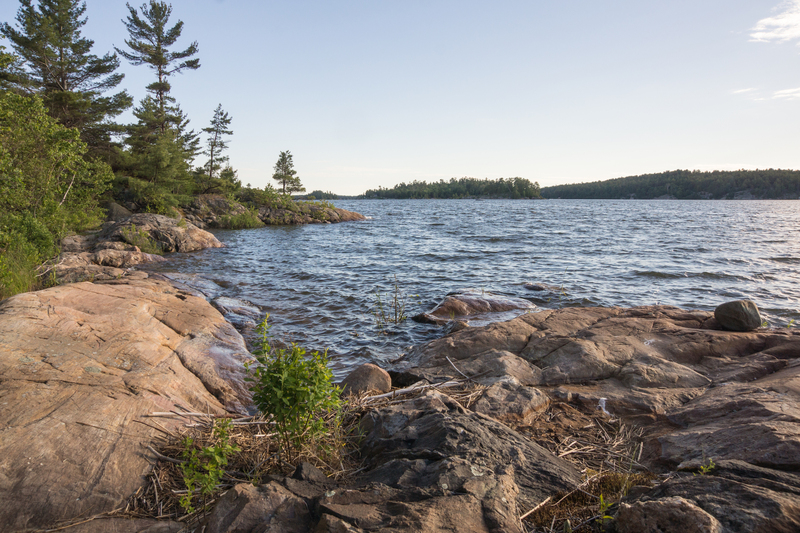 Free camping is not allowed on Point Grondine land; however, in August of 2015 Point Grondine Park opened with day and overnight hiking trails developed with the help of Killarney staff. 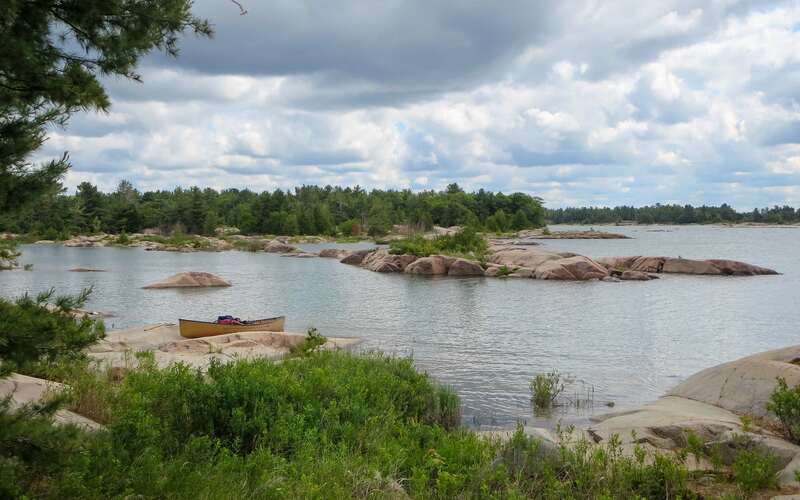 There are two designated campsites in the Killarney P. P. stretch of Collins Inlet. You can camp for free on the other side of the inlet on P.E.I.! A Toronto Star article from September 10, 2015 provides some basic information about the planned change in land ownership: Access To Pristine Land At Stake In First Nations Deal. 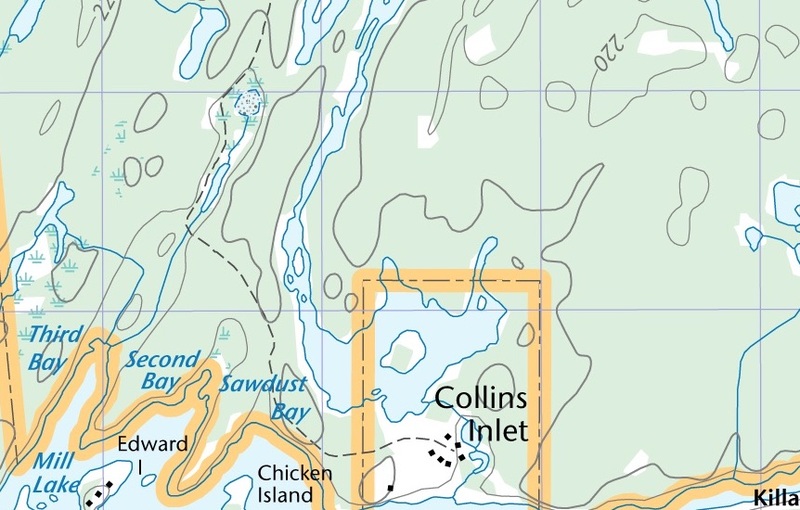 This entry was posted in Georgian Bay, Pictographs of the Canadian Shield, wilderness canoe tripping and tagged Ambush Narrows Collins Inlet, Beaverstone Bay, Big Rock Bay campsite, Collins Inlet, collins inlet thunderbird, Fox Islands Georgian Bay, Group of Seven Georgian Bay, Hincks Island camp, Kas Stone Georgian Bay, Mahzenazing River, maps Philip Edward Island, Mill Lake Lodge, Unlostify Georgian Bay, Wikwemikong land claim. Bookmark the permalink. 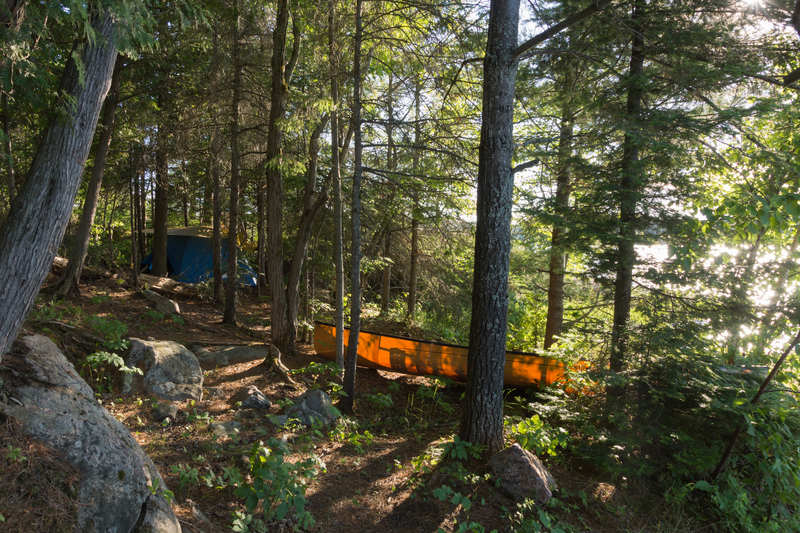 In your photo heading down a channel… there is a beautiful campsite, on Deer Is. at the top of the little cliffs. Gorgeous site, room for 4 tents, flat and protected with a nice wide open vista front. Next time. Ken, welcome back to The Six! It sounds like you had a rewarding year up there! Re: your campsite tip! Thanks for that. “Next time” indeed! It sounds like an A+ site! We paddled past Deer Island on our way to Hincks Island. I do remember a string of cottages on Deer Island and assumed the entire island was private. Looking at Jeff’s Killarney map now I see that it has two campsites indicated on Deer. 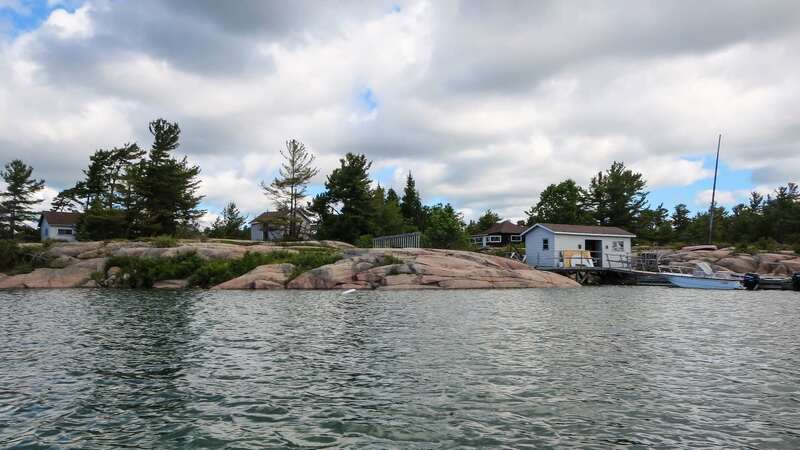 We are definitely going back to the north end of Georgian Bay – maybe next September. 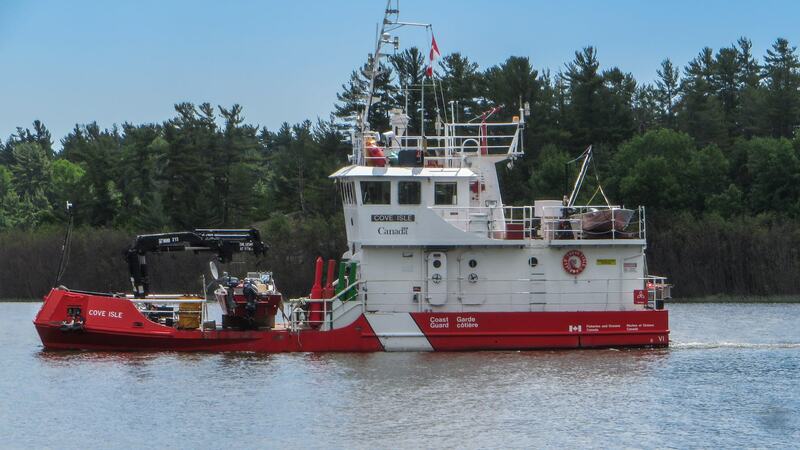 When we do, we’ll pass up on the Collins Inlet stretch and just stay out on the Bay. The plan is to arrange a shuttle up to Chikanishing from Britt and then paddle back down to Britt over seven days or so. 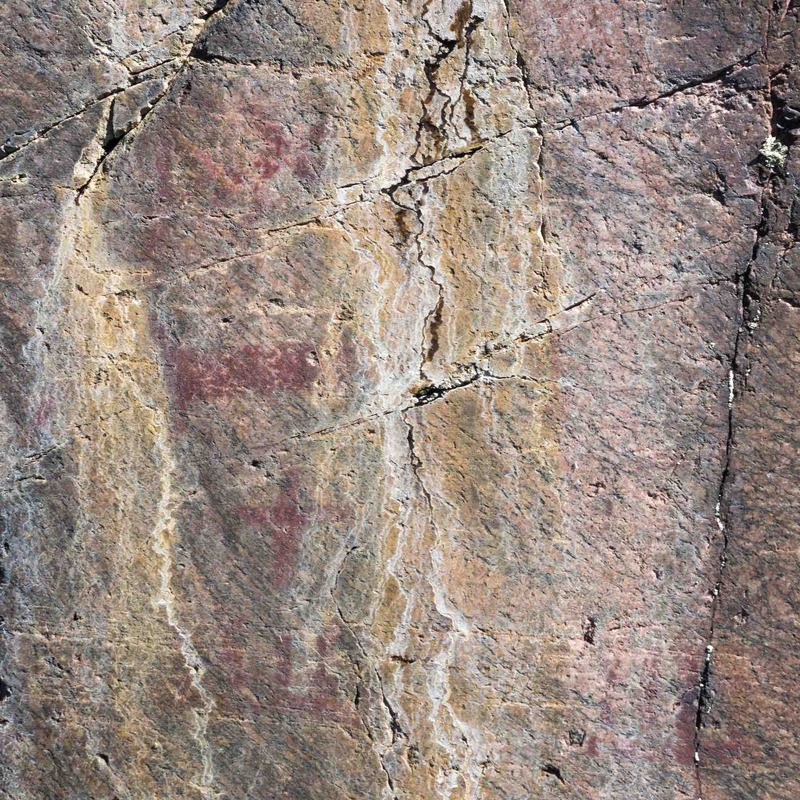 Thanks for posting the pictographs photos. Have just returned from the pictographs at Missinaibi. B.P., it has been a while since I paddled by Fairy Point! Definitely pre-digital camera days. Didn’t take many pix – slides! – in those days. Send me the your blog link if you’ve upped any of your shots! 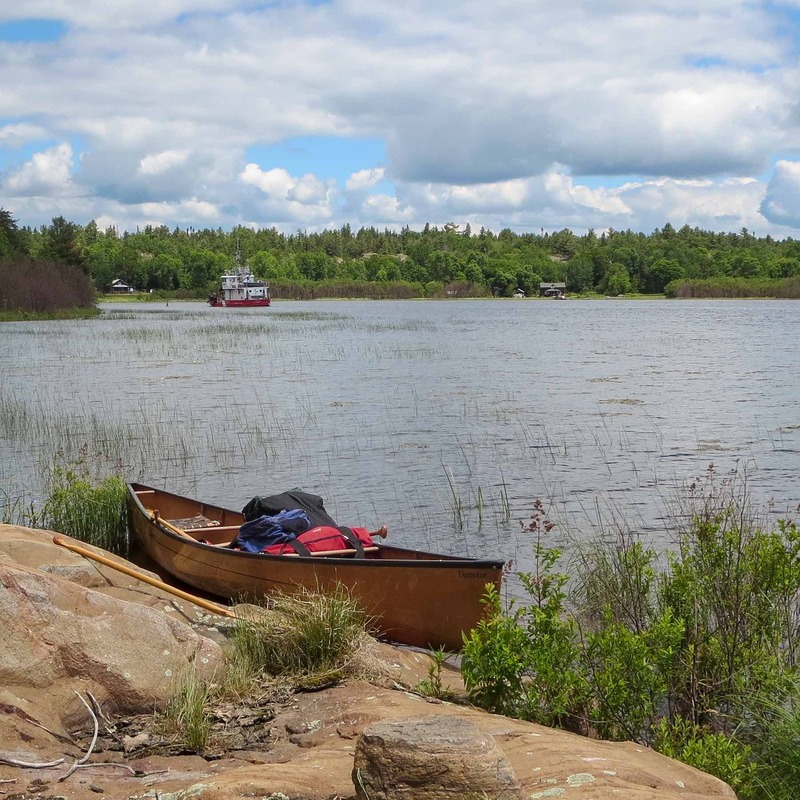 The four pictograph sites on Little Lake Missinaibi and the three on Lake Missinaibi may be the focus of a May-June 2017 canoe trip! So many trip possibilities, so little time! Hope to take Bill and Kathy to this site in May. Thanks for such a thorough tour. It was a fantastic mini canoe trip. In May you will have the place to yourselves! BTW – a second supposed site a short distance up the Mahzenazing River – it is indicated on Jeff’s Killarney Map – probably does not exist. I am not sure where Jeff found the reference to this site. He also has misplaced the Mill Lake Lodge; it is actually across from the mouth of the Mahzenazing on Philip Edward island. It is alive and well and looks well cared for. The lodge just up from the mouth of the river is the Mahzenazing Lodge. It was for sale when we paddled by last June. It looks somewhat neglected. A reliable source told me he spent two hours searching at and around the spot indicated on Jeff’s map a couple of summers ago and came up empty. P.S. Could you get a nice closer-up shot of the remains of the old village dock that I could stick into my post? The one I got was taken from across the inlet on the Mill Lake Lodge side and we were too lazy to paddle back for a decent perspective! 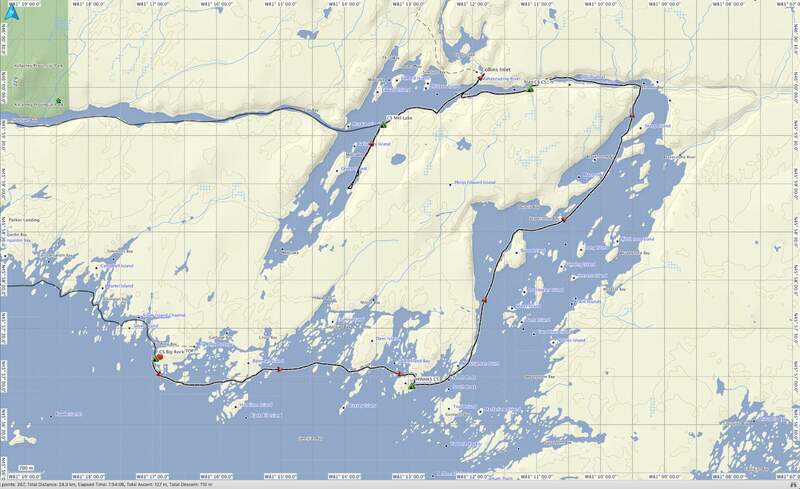 A close friend and paddling partner and I are considering a circumnavigation of PEI during the second week of August. We are both retired so dates are somewhat flexible according to weather. I just wanted to say that I found your trip report extremely useful and expertly documented. It was a pleasure to read and provided a wealth of valuable information. Thank you. Terry, the ’round-P.E.I. trip is a beautiful one, with the first half down the Bay Coast to Beaverstone Bay especially so. The Collins Inlet stretch on the inside is the more quiet half but it was neat to see the remains of the village of Collins Inlet and to see some of the rock paintings at the pictograph site on the way back. The best campsites are definitely on the Bay side but as you approach Chikanishing there are a number of decent spots on the island if you want to extend your stay an extra night. Enjoy your circumnavigation – and good luck with the weather! Like Terry above, we are planning a trip and it may be a PEI circumnavigation like yours. Thanks so much for the detailed writeup and trip planning advice. How were the bugs on yout trip? Ginger, the PEI area is a great place to spend a week. 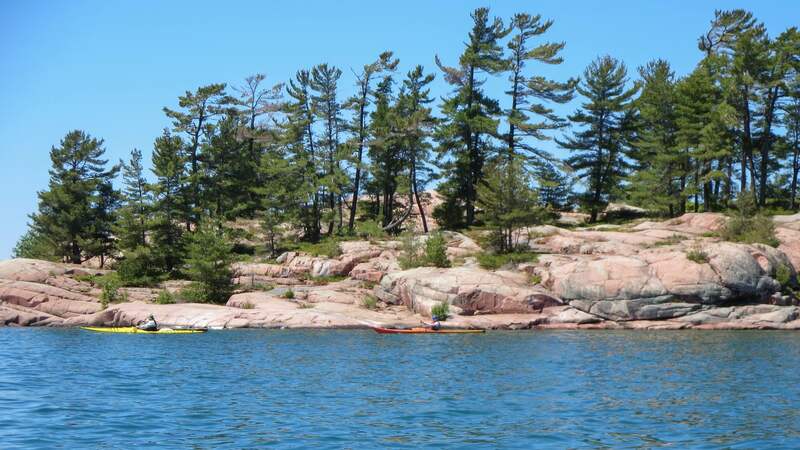 Great campsites, beautiful views, sheltered paddling, for the most part, th​an​ks to the many islands along the coast. We were there in late June. Bugs not at all an issue – but we did have our Muskol and we also treat our pants and shirt before the trip with a permethrin ​spray. Another nearby spot with all of the positives of PEI is the French River delta area, easily accessible from Hartley Bay Marina. 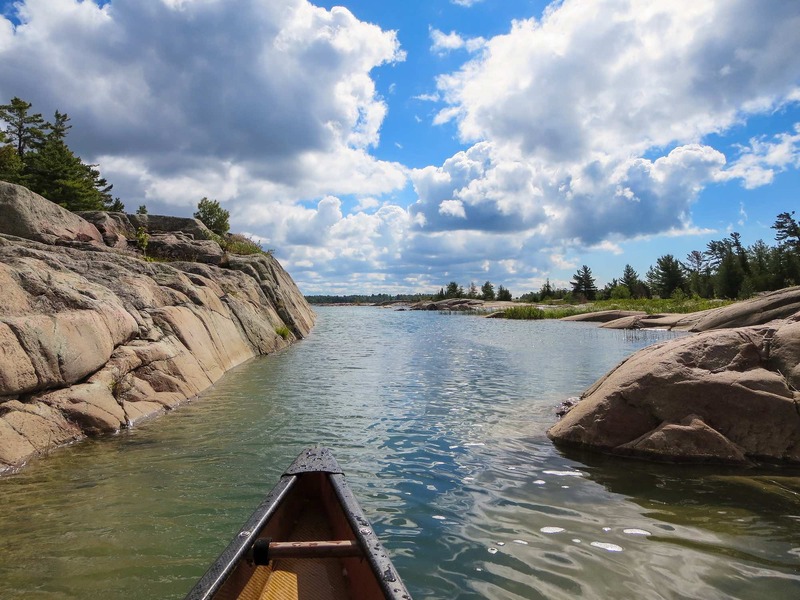 See Canoeing Georgian Bay’s French River Delta: Logistics, Maps, & Day 1 for more info! 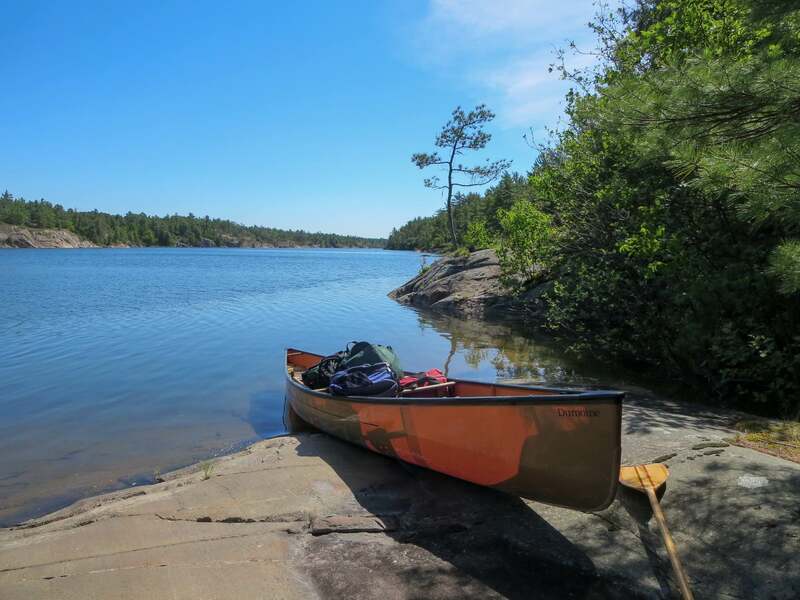 Of all the paddling we’ve done, we think the ​stretch of Georgian Bay from Killarney down to Parry Sound is the most scenic and has the best campsites. Feel free to email me at true_north@mac.com if you have any other questions.